Overview - Director Steven Spielberg's heartwarming masterpiece is one of the brightest stars in motion picture history. Filled with unparalleled magic and imagination, E.T. follows the moving story of a lost little alien who befriends 10-year-old, Elliot. Experience all the mystery and fun of their unforgettable adventure that captivated audiences around the world. Thirty years since its initial theatrical run, the story of the friendship between a boy and an extra-terrestrial still manages to bring me to tears. The bizarre alien creature that awkwardly wobbles from a tool shed towards a terrified Elliot (Henry Thomas) with Reese's Pieces candy in hand looks just as ugly and strange as the first time audiences saw it, but in the capable, brilliant hands of Steven Spielberg, the weird puppet, animatronic or little person inside a costume becomes an extraordinary and surprisingly believable being we soon grow to care for and even wish to be a part of our own lives. The fact that the film can still work its magic and be just as effective as ever is a testament to the work done by the filmmakers and of Spielberg's mastery of the craft. Following one box-office success after another (except, of course, for the cult favorite comedy '1941'), Spielberg inserted that same level of awe-inspiring excitement and child-like wonder he achieved in 'Raiders of the Lost Ark' the prior year. Only, here, he seems to further explore what could be accomplished with the camera and ultimately perfected his unique approach, one which came to define the 80s style of moviemaking. From lens flares and the beautiful, colorful cinematography of Allen Daviau, the film is an endless array of shots which actually facilitate an emotional response from viewers as well as enhance a particular scene. The most memorable is Elliot's first actual meeting of E.T. in the backyard, where Spielberg alternates between a variety of shots, clearly expressing the boy's fear and panic, and we're right there with him, experiencing the moment. And look no further for the most imaginative use of the camera than in his treatment of Peter Coyote's mysterious government agent, known only by the key rings hanging from his belt and the chiming sounds they make. On a more thoughtful and skilled level, the cool camera device and recurring motif is actually part of a grander scheme, an allusion to one of the plot's more insightful themes. Throughout the film, Elliot's mom (Dee Wallace) is the only adult whose face is ever seen for the first half of the movie. We get an idea of why Spielberg is doing this when Elliot tries to convince his younger sister Gertie (Drew Barrymore) that only kids can see the alien, essentially implying that the story's point of view is from their perspective of the world. The reason mom can be seen is because the kids not only have direct contact with her, but because she shares in their pain of dad's absence and in some ways there is a child-like quality about her. The other grown-ups, including the science teacher, are faceless figures, like something out of Charlie Brown. Their presence outside of the home is one of authority, and while they're always there, they're never really seen. Mom isn't as imposing as "Keys" and her company brings comfort. It's not until Coyote's character and his ominous agenda force their way into the family home, like an intrusive invasion upon a child's imagination, that other adults suddenly come into existence. We can read more into this, if one so wishes, or simply take it as another creative feature to a wonderful classic. Either way, it's a brilliant show of Spielberg's genius behind the camera to acutely reflect the emotion of the story. The narrative on its own digs even deeper, hitting a very personal chord for many viewers with its tale of friendship and a its push for tolerance. At face value, it's essentially a reworking of a very basic and somewhat familiar formula — a coming-of-age story about a boy coming to terms with the realities of the world. As ugly and difficult as it is navigating through this world, the boy learns that the longing for family and personal attachment is the same for everyone, even visitors from other planets. Being a Spielberg production, of course, that attachment is made quite literal in the special bond Elliot shares with E.T., and as is also typical of Spielberg, the story brings a darker edge to suburbia, where the perfect image of the modern family is disrupted by the heartache of divorce. This is also a story about a boy confronting any abandonment issues he might have, finding comfort and understanding by befriending an alien who also feels abandoned and alone. As corny as it may sound, E.T. 's health deteriorates not from a prolonged stay on Earth, but because of a lack of familial love, the most important aspect for a healthy, happy life. In helping him phone home, Elliot and his family grow closer than ever and endure an unpredictable future together rather than alone. During its original theatrical run, this modern fairytale of contemporary life became an instant box-office smash and quickly grew into a cultural phenomenon and icon of the decade. It endures as a magical and memorable masterpiece of cinema because the story comes with a timeless, universal message which future generations of moviegoers can continue to cherish and admire. Universal Studios Home Entertainment brings 'E.T. 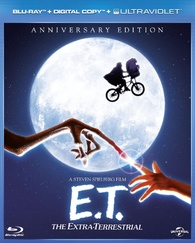 the Extra-Terrestrial' to Blu-ray as a 30th Anniversary Edition in a two-disc combo pack. The Region Free, BD50 disc sits comfortably on a panel opposite a DVD-9 copy of the film. Both are housed inside a blue eco-lite keepcase with a glossy, reflective slipcover that has the title embossed. The package includes a code for an UltraViolet Digital Copy and an ad for a game to download on mobile devices. The disc is very slow at startup, likely due to internet connectivity, but after that minor hiccup, the screen changes to the standard main menu selection while full-motion clips and music play in the background. Restored and remastered from the original 35mm negatives, 'E.T. the Extra-Terrestrial' lands on Blu-ray with a terrific 1080p/AVC MPEG-4 encode. The cinematography of Allen Daviau is well preserved and remains faithful to the intentions of the filmmakers. A large portion of the film was shot indoors with poor lighting conditions, an artistic choice which reflects the story's many themes. Despite the amount of heavy shadows and limited light, details come through without issue, revealing many of the small trinkets and pieces of furniture scattered throughout the family house. Fine lines are distinct with excellent lifelike textures on the faces of the cast and on a variety of clothing. E.T., in particular, looks especially realistic with a never-before-noticed slimy sheen, allowing fans to fully appreciate Carlo Rambaldi's creation. Daylight exteriors, as would be expected, look best with sharp definition in the surrounding foliage and the architecture of the suburban neighborhood. Presented in its original 1.85:1 aspect ratio, the transfer displays a fine, visible layer of grain that's consistent and stable with a crisp and well-balanced contrast. True to the film's deliberate look, interiors are quite dim and dark with an interesting haze and lots of shadows. This has a slight effect on the color palette, but primaries are accurate from beginning to end with warm secondary hues. Black levels are also somewhat effected, but not to any damaging extent, appearing quite rich and deep for a majority of the movie's runtime. The only issues of concern are a couple poorly-resolved scenes which creep up from time to time, but that's related to the age of the negative and not a problem with the transfer. All in all, the picture quality is in excellent condition and should satisfy fans. 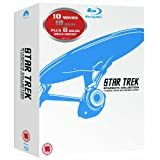 The sci-fi family classic also arrives with a spectacular and immersive DTS-HD Master Audio soundtrack. Without a doubt, the track's greatest and most thrilling aspect is the memorable score of John Williams, breathing life to the sound system with rich detail and clarity in all seven channels. Every time the haunting, fairytale-like motif comes on, the front soundstage fills with warmth and fidelity, generating a wonderfully engaging image. Dynamics and acoustics are crisp with sharp, almost lifelike precision in the instrumentation. Vocals are clean and well-prioritized in the center with remarkable intonation, allowing for viewers to hear every tearful piece of dialogue. Low bass is appropriate for a movie of this vintage, mostly reserved for providing depth to the music. Equally impressive, and adding to the overall joy of listening to 'E.T.' as if for the first time, are the surrounds, utilized on numerous occasions to enhance the action. Surprisingly, discrete effects never sound artificial or forced. Instead, they create a satisfyingly immersive soundfield with excellent directionality. Subtle atmospherics in outdoors sequences broaden the listening area while the sounds of cars or space ships flying overhead move with fluid, flawless panning. Williams' music also participates in the fun with great envelopment, pulling viewers into the middle of the excitement and drama. It's a fantastic lossless mix that long-time fans will love, like watching the film again for the first time. Many of the supplements from the previous DVD releases are ported over for this Blu-ray. Missing is the Steven Spielberg intro, a live performance with John Williams conducting and the interactive space exploration featurette. A Look Back (SD, 38 min) — A short making-of doc, formerly exclusive to the 3-disc DVD, features interviews with cast & crew talking about their experiencing on the production and sharing many wonderful memories. Tons of BTS footage plays in between the comments, making it a great watch for fans. The Evolution & Creation of E.T. (SD, 50 min) — A bit more recent and longer doc than the previous, showing Spielberg talking about the story's origins, the film's themes and the personal influences the director injected into it. With more BTS footage interspersed throughout, several comments from other key players revolve around working with each other and the alien creature, the casting and of course, developing the right look for E.T. and the casts' emotional response. Best bits are towards the end with comparisons of the original 1982 cut to the digital alterations of the 2002 version, which actually look awful but Spielberg defends wholeheartedly. The E.T. Reunion (SD, 18 min) — Steven Spielberg and Kathleen Kennedy reunite with the main cast to talk and reminisce on the production, working with one other and the film's impact on each person's life. The Music of E.T. (SD, 10 min) — A brief but fairly interesting conversation with John Williams, where he talks about his impression of the film and about developing one of the most memorable cinematic scores. The 20th Anniversary Premiere (SD, 18 min) — A look at the preparation, rehearsal and work that went into the 2002 theatrical premiere with a live performance of John Williams's score. Deleted Scenes (HD) — The two, now-infamous scenes which were restored to the 2002 re-release of the film with digital alterations are collected here. Designs, Photographs and Marketing (HD) — Broken into six categories, this is a still gallery of concept art and design by Ed Verreaux, Carlo Rambaldi and Ralph McQuarrie. There is also a large collection of production stills and marketing photos for fans to enjoy. Trailers (SD) — Along with the original theatrical preview, there is also a vintage TV spot for the Special Olympics with E.T. Following one box-office success after another, Steven Spielberg delivered another blockbuster smash with 'E.T. the Extra-Terrestrial,' a sci-fi masterpiece about friendship, family, and dealing with feelings of loneliness. During its release, the simple story of a boy befriending a stranded alien captured the imagination of the world, quickly growing into a cultural phenomenon and is today remembered as a timeless classic with a universal appeal for future generations. The Blu-ray lands with a spectacular and cinematic high-def transfer, along with an excellent audio presentation that will surely entertain. While many of the supplements are the same from previous DVD releases, the package includes two new exclusives that will satisfy fans, making this Blu-ray edition a must-own.